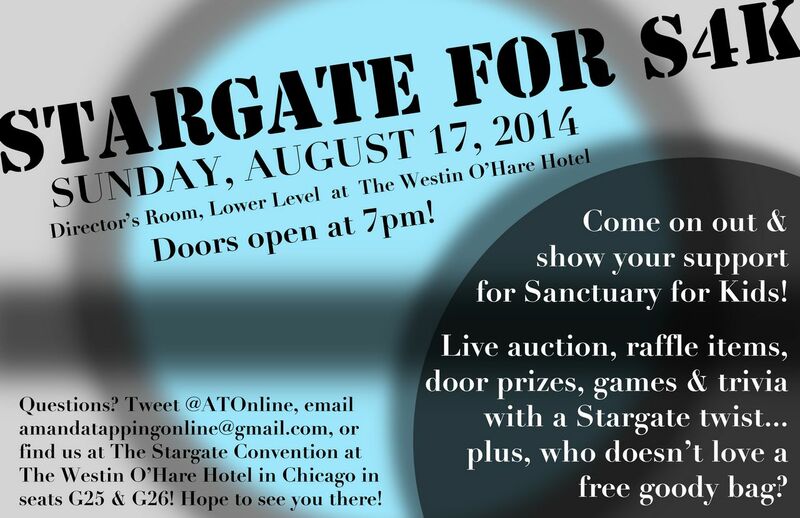 Come one, come all to a Stargate themed charity fundraiser for Sanctuary for Kids. When: Sunday August 17th, 2014. Doors open at 7pm. Where: The Westin O’Hare in LaSalle A on the main floor. There will be a poster indicating you’ve arrived at the right room. Why: We love Stargate, we love event planning, we love charity and we love Amanda. We’ve told you a little about the fundraiser before but here’s all the nitty gritty details. Starting at 7pm on Sunday following the Stargate Chicago Convention at The Westin, we will be hosting a charity fundraiser using Stargate as the theme. We will have refreshments, welcome goodie bags full of fun items designed especially for you (and only available here), there will be a door prize, raffle items, auction items, trivia prizes and hi-jinks (of course). Hello visitors! You may have noticed that I haven’t announced this years birthday project to benefit Sanctuary for Kids yet. There’s a very good reason for that, we’re trying something new this year. Instead of collecting donations for Sanctuary for Kids and cards for Amanda, we’re doing a fundraising event at The Westin following the Stargate Convention in Chicago on Sunday August 17th. It will be all inclusive so fans of all three shows will find something that interests them. There will be no cover charge, the event is free to all. You do not have to be a con attendee in order to come to the event because this event is in no way affiliated with the Convention or Creation. If you live in the Chicago area, please feel free to attend whether you’re attending the convention or not. Although the event is free, this is a fundraiser so our goal is to raise as much money as possible; we will be accepting donations for S4K at the door and via various donation boxes throughout the room and no contribution is too small if you are able to give.All donations must be in cash or via the Sanctuary for Kids website made on your phone. We have raffle items, auction items, game prizes, giveaway and goodie bags. We have unique items designed especially for us and this event that will be part of the raffle/auction or as a prize/giveaway. We’ve even designed a game (Cards Against Goa’uld anyone?) that we’ll raffle off at the end of the evening. Doors will open at 7pm (exact meeting room location TBA) and will run until everyone falls asleep on us or 11pm, whichever comes first. All donations and auction bids must be cash only or sent via the Sanctuary for Kids website on your phone. We have no way to accept credit cards at this time nor will we accept any checks. We will accept donations in CAD and US dollars though. If you will not be in Chicago on Sunday night, we will be having an online auction, raffle and giveaway when we return home. It will run from August 19th until August 27th. It will contain many of the same items that will be at the fundraising event, and maybe a few different ones. More information and a flyer are to come in the next couple of days. Please spread the word, and if you have any questions or comments you can reach me via email (amandatappingonline@gmail.com) or twitter (ATOnline). And as always 100% of everything raised will go directly to Sanctuary for Kids. This is not an official Sanctuary for Kids fundraiser, just the crazy brainchild of two would-be event planners, but we have spoken with the higher ups over at S4K and have their approval.